﻿ What are some ways to kill an opossum in the yard? What are some ways to kill an opossum in the yard? If it is legal in your area, and you can responsibly and safely use a firearm, shooting the animal is one of the most effective and humane ways to kill the animal. Lethal traps are probably the most effective and efficient ways to kill these animals. Lethal traps include the body grip traps, like the 220 connibear trap. These traps are used by fur trappers. They are difficult and dangerous to set if you are lacking experience. They must be set just right. If set in the wrong area, they can kill any animal, such as a skunk, stray cat, neighbor's cat, or dog. NEVER USE POISON! There is no legal or effective poison for possums. If you set out poison, any animal might eat it (you'd be surprised how many critters roam your yard) and that animal will likely get sick, but not die. Do you really need to kill the possum? Opossums have continued to create problems and untidiness in gardens and backyards where they also tip over garbage cans or roam around your fruit bearing plants and sometimes attack your pet's food or living space. Protecting your gardens from daily visitors may be a very difficult task as they are nocturnal, so you may never see them. With the help of these deterrent methods, you can easily get rid of the opossums in your yard or garden. Repellents are one common way to get rid of the opossums in the yard but not permanently. Before using these repellents, first find out the frequent locations of the opossums, which can be tripped over garbage cans, your pet's food dish, or eaten plants. Opossums are mostly found near steps or low platforms or near old trees and burrows as they live in woodland areas. To use the repellents, read the instructions carefully and before use make sure to cover all food items such as pet food or tree fruits, etc. Strong scented items would help to repel opossums from your yard and garden. The most frequently used are ammonia, garlic and mothballs. Place a little bit of ammonia in a jar or a coffee can that is enclosed with a lid. Add a rag to the ammonia and place one end up and cut a small hole for the scent to diffuse. Place these where you often spot opossum gatherings. Spread mothballs all over the place as away to leave the strong smell, or even crushed garlic may help. Sprinklers or light exhibiting via motion: Now that technology has advanced, take a little help from it. Besides using strong smelling items, use a motion activated sprinkler or light; attach it to your house walls and see how it detects the opossum and sprinkles water to scare it away from your pet's food or fruit trees. The light may only work on small opossums, but the sprinklers are very effective. 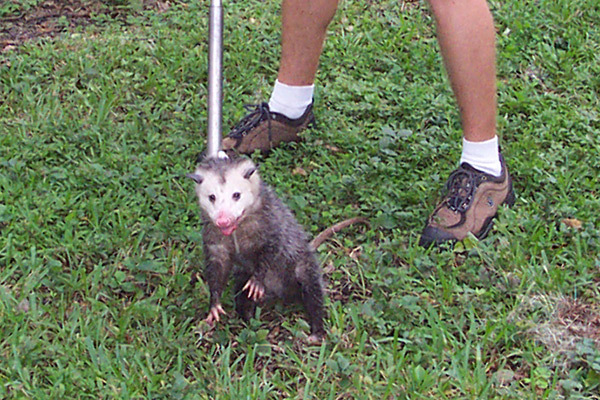 Traps are a common way to get rid of opossums, but some are banned in cities (the killing ones). Keep traps in places where you often spot them or along the path you suspect they follow to the trash can or to the garden. Place the opossum bait inside the traps such as fruits, veggies, and berries. Place any play toy or moving object inside the trap to keep the animal occupied when relocating or to distract it from escaping. What are some humane ways to kill an opossum in a cage? It is better to return a live possum back to its habitat after catching it, but leaving them alive comes with a risk of re-invasion. That is why some people recommend killing the marsupial right within the cage. Poisoning is the most convenient option, although there is no legal poison available to kill the opossum and some state laws do not permit it. Furthermore, it may happen that the toxin is ineffective and the mammal will be kept alive although it may suffer greatly. Another dreadful possibility is that the poison could be consumed by some other living being. Cyanide is the most common poison used globally to kill the animal inside the cage. Special care should be taken while placing the cyanide capsule inside the trap. Place the cyanide pills in bait stations to lure possums. Be cautious to remove the bait platform as soon as possible with not a bit of leftover cyanide. Vitamin D3 is another humane type of poison to kill an opossum. Usually no licensing or formality is required to use this toxin for opossums. Cholecalciferol restricts calcium metabolism and the target organism dies within a certain number of days. Animals in cage traps can be sprayed with lethal exhaust fumes. They must be cooled enough to give less suffering to the animal. The trap is covered with a plastic cover and gas is blown in via pipes, which are insulated to cool the gas or gases can be simmered by water for a cooling effect. Gassing is inexpensive and a comparatively safer option. A lethal trap to kill the opossum is a rare option because many states forbid it, but it is functional. These lightweight snares are spacious enough to entrap cats or dogs, and there is a great risk of killing such an animal. These inexpensive cages are kept in your yards to kill the opossums. It should be used 150 meters away from your premises. The law in most states is that leg-hold traps should not be used within 150 meters of a home without the permission of the residents, or in any region where there is a likely risk of catching an unintended animal. These traps should not give any physical trauma to the animal. All cage traps whether lethal or not should be inspected at least once daily. Killing any living creature does not sound good, but it can become inevitable in some cases.